With the sales office having been open since March and contracts for roughly 60 percent of the 61 condominiums that are finishing up construction at 388 Fulton Street having been signed, prices for the unsold units have just been reduced by up to 6 percent. While the marketing copy for the Hayes Valley development, which is being marketed by The Mark Company, still reads, “Studios from the mid $500,000s and 2BRs from the mid $900,000s,” studios at 388 Fulton are now listed starting at $508,000 and two-bedrooms from $899,000. And while still not “cheap,” the unsold units are now up to 6 percent cheaper and listed from around $1,250 per square foot, down from over $1,300 per square foot last week. How small are these 2 bedroom apartments? If you divide 899,000 by 1250, you get 720 sq ft. That seems pretty tight for 2 bedrooms. Yeah the units are small… The 2 bedrooms are one bath floor plans and about 700 SF (Normal 1 bd size, right?). The 1bd’s are also on the small side 400-500 SF. I once lived in a 625 sq ft 2/1 apartment. That was really tight. Had to get a sofa custom made to actually fit in the tiny living room. I’m currently in a 815 sq ft 2/1, which while still on the small size seems huge compared to the previous place. Also — the ugliest building ever constructed. Agreed, we all have our preferences though and since Taco started it, I submit this really pleasant bunker: 2020 Ellis, added to Divisadero a few years back. Not going away for at least a century, thanks Planning Toadies and Saitowitz. I agree. it is a great looking, modern, urban textural building. And yes, I suppose everyone is entitled to an opinion, but the work of David Baker architects is well respected and his firm produces interesting, colorful and desired projects here in The City. And remember, the units are selling quacking; this is a great location for new housing. Living a block away from that ugly building I disagree, it actually isn’t a vast improvement over the vacant lot nor the gas station. Well, thanks for your opinion, but really amazed when someone ACTUALLY prefers an existing vacant lot and a gas station over new, well designed urban housing. I don’t get it. I honestly don’t get the VAST disagreement here with almost all new projects being built in SF today. For the most part, here on SS, there is more negative comment than positive comment on any one project on any given day. What do people want? What do people like? I don’t have any problems with this development, nor most new places in SF. Some like the salesforce tower, I just preferred an alternate design, so enjoy mocking it for its phallic nature but don’t really hate it. But 2020 Ellis on the other hand, yeah I detest it. It reminds me of a prison or like the police station on Fillmore and Turk (windowless wall facing the street). It is basically an FU to the street and the neighborhood saying “we want nothing to do with you”. Divisadero needs more retail in that stretch to help connect NOPA to Geary Street. The vacant lot had the potential to one day be improved to include some retail, yet now 2020 says nope, go away, we don’t want people walking around here. You call it urban, but it isn’t. It’s says go get in your car and drive out the neighborhood. Well said Rillion. I lived a block from that gas station for nearly twelve years before the development of 2020 Ellis and everyone of my nieghbors had high hopes for the site. A major planning failure and now there is really no way to enliven the stretch from Geary to Turk. A lost opportunity compounded by the ever present crime associated with the nearby projects. Well said. I think the same thing every time I walk from McAllister down to Walgreens. Occasionally, I’ll make the walk past Geary to North Divis, but it’s not very pleasant and this building epitomizes what’s wrong with the walk. It looks like Tim Burton designed it. Not only hideous, it will get incredibly hot on sunny days, and leak heat on cold days (black, you know). The birdsh*t and dust that builds up over time will make the exterior even more magnificent. Ever own a black car? Too heavy on the corner, they should have gone to a 1 1/2 – 2 story retail base at least at the corner to lighten the load of the mass on the corner. Columns exposed, or articulated on the façade at least for the 1st two-three stories. They also could than accent the top floor a bit more with the sun-shield materials to accent solar, or a roof-garden at the top. (costs probably drove most of the decisions) but the aesthetics are decent. Needs a splash of color somewhere, either green, or in the retail signage/components installed later…? Building not even complete and is 60% sold out. Check. 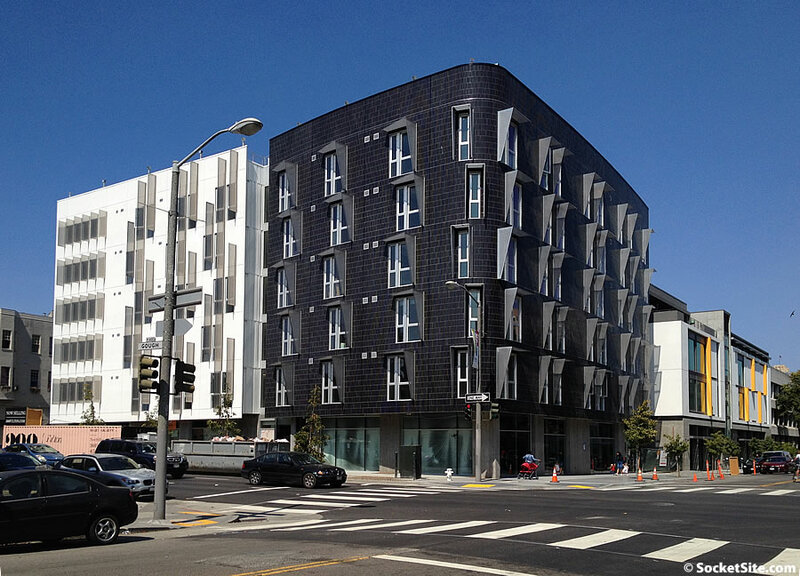 Brand new Studios in Hayes Valley facing virtually no competition in the $500K range. Check. 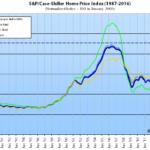 Minor price change portends dramatic downturn in RE market. Uhhh….. check? Yeah, you better wait a year for all of that excess supply to come on line. This is a really ugly building. Also the small windows probably make those units very dark inside. Have to chime in, I love this building. I live by 2020 Ellis and a little bit of color, even dark color like this, would have been very nice, anything is better then battleship grey. Personally think both buildings should have been a few stories taller but God forbid I don’t want to start that cat fight again…oops just did it. My biggest complaint about 2020 Ellis is the side that faces Divisadero. Not friendly to the neighborhood, like living next to/across from a blank grey wall. I wish the building had been 1-2 stories higher and had some retail on Divisadero rather than prison wall and gate. I think you are right. This is a really handsome building and distinctive but not in that undergraduate-architect-intern way of many other recent projects. No Parking, busy street, and tiny spaces…have at it suckers! Brutally ugly and another Mark Co. sales disaster in the making. Same cast of empty suits as the last disaster. Does anyone ever leave town to see how it’s done? Gorgeous mid-rise condo buildings abound in Seattle, LA, Portland, NY, Chicago, even Phoenix (see Optima on Camelback). What’s wrong with us? Why is second rate at twice the price always OK here? Because by the time the City has taken up all your time & money, and people who have no business in the business of building have a say, there’s not time/money left. 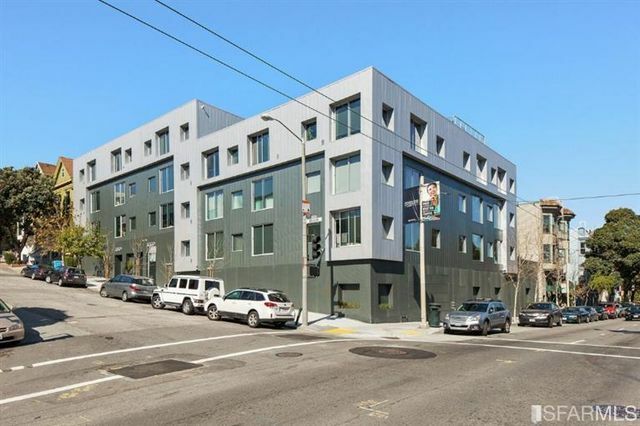 This is an attractive building, better than most rectilinear stack & packs, but seems like they’re making their money from fools who think 700 sq qualifies as a 2 bed ‘starter home’ w/ $500 HOA’s. No thank you. Wait – which bldg is everyone Ugly-ing on? 388? 2020? (388 never had a gas station – under the f-way). I don’t have an opinion as to the aesthetics. But isn’t ALL new construction pretty cramped and sparse? Compare to units from the 20s or 40s, where even ‘working class’ accommodations were relatively roomy – at least by todays standards. Compare the Barcelona & 55 Page for spaciousness. Marginal location, intense traffic. At $ 1300 psf this seems insane. If prices are dropping that much on unsold units, then they will have trouble holding on to signed contracts not yet closed. 3% deposit is less than market drop. One Rincon cascade down again. MIllenium bought the units back when they had same problem at market street / 4 seasons. but very few developers can or will do that to protect values. Lender should be watching closely and approving every deal and counter offer if they are smart. I bet the original buyers were at lower prices, in fact they were. So no issue more than likely. Just strange that they chose to blast that message out. I disagree with the “marginal location” assessment. I’d rather live here than SOMA/Rincon or most places in the city. UPDATE: Prices for the unsold units at 388 Fulton Street have just been reduced again by as much as $34K or another 3.5 percent.